Most often attorneys communicate professional legal advice through in person or telephone conversations with clients. Sometimes however, an attorney is requested to provide legal advice in a formal written legal opinion. A good place to start for guidance on drafting such an opinion letter is Legal Opinion Letters: A Comprehensive Guide to Opinion Letter Practice. Edited by Attorney M. John Sterba, Jr. and updated annually, this one volume loose-leaf treatise, published by Wolters Kluwer Law & Business, covers virtually all substantive areas of legal opinion practice. The first two chapters includes an introduction to written opinions and elements to include in a typical opinion letter. Following chapters detail the drafting of legal opinion letters in areas of law such as corporate, commercial and banking transactions, real estate transactions, securities law, tax, intellectual property, bankruptcy and lien opinions, as well as attorneys' letters to auditors. Sixteen appendices are included, many of which detail various reports issued by the New York TriBar Opinion Committee as related to drafting and issuing opinion letters. Sample opinion letters are also featured in several chapters on the topics listed above. 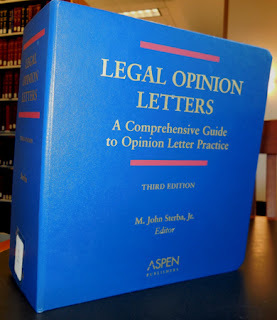 Search Hint: To find other library sources on opinion letter practice in other areas of the library we suggest a catalog search for the subject heading: Legal Opinion.